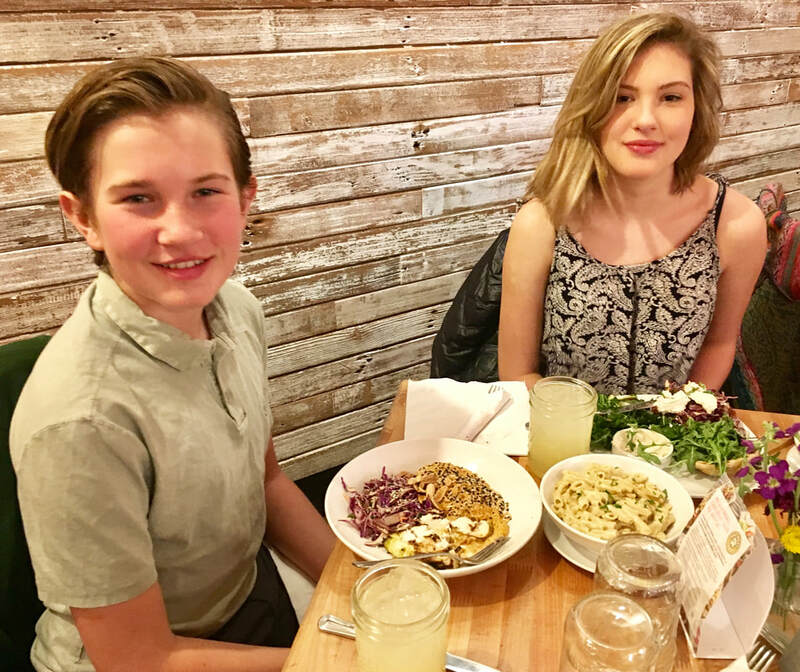 On Fresh Thymes' website, we saw this particular sentence, and it made us smile because it is a great reflection of what the Kids' Kritics are all about: "Our food tastes so good you’ll swear it’s at least a little bad for you. Note: It’s totally not, but we won’t tell the kids if you don’t." This is a great restaurant for us to review because it was easy to find kid-friendly food here...even if it is healthy! ​THE KIDS' KRITICS CHOICE AWARD! Fresh Thymes Eatery focuses on fresh, non-GMO, organic and all-around healthy foods. The partly vegetarian and gluten free menu may be scary at first, but at a closer look the food is delicious. After talking to owner Christine Ruch, we discovered there is no kids' menu, Ms. Ruch believes kids should eat what their parents eat. Ms. Ruch also focuses on having no hidden ingredients in her restaurant's foods. Some restaurants have unlabeled butter, dairy or other items in their dishes. At Fresh Thymes you don't have to worry about eating something you don't want to eat or that you may be allergic to. This popular eatery was "slow" the night we ate at Fresh Thymes according to Ms. Ruch, but it seemed pretty busy to me. "At lunch we have a line going out the door", Ms. Ruch stated. I'm not surprised that everyone wants a bit of this extraordinary food. The Ginger Limeade was the perfect drink to sip on in between bites of my meal. The subtle ginger was not overwhelming, and it was not overly sweet like most lemonade or limeade. I loved this drink. To get a better idea of all the different counter options, Ms. Ruch made us a sample platter of several items including the Kale and Arugula Salad, the Brussels Sprouts, the Roasted Beet Apple Salad, the Black Lentil and Delicata Squash Salad and the Chickpea Flatbread. The Beet Apple salad and the Chickpea Flatbread were my favorites. The Beet Apple Salad was served cold and was very refreshing. It had a sour tang which made it very enjoyable. I would have loved more apples. Soon I moved on to the Brussels Sprouts, and right off the bat I discovered they were crunchy. It is a common problem for chefs to make Brussels sprouts mushy. I DON'T LIKE MUSHY VEGGIES! These had a touch of sweetness and a touch of spice, which I'm guessing was from the mustard seed. Kids, I think you should give this dish a chance since it was a wonderful appetizer. I had the Kale Salad next. Kale salad is my go-to dish, and this one tasted just as good as the one I make at home. It was lemony and went well with the beets. Next I moved on to the Black Lentil with Delicata Squash Salad. This dish took me back to eating lentil soup and cornbread with my family after a long day of skiing. The salad was a bit spicy, but it wasn't too overwhelming. I enjoyed this salad. To end off our appetizers I enjoyed the Chickpea Flatbread. The bread was moist and citric. There was a side of rosemary oil that made a wonderful addition to the already amazing bread. I could go on and on about this snack. I absolutely recommend the flatbread. Next I had the Mac Attack. When looking at the menu I mentioned the mac and cheese (which is made with cashew cheese), and my teacher said "That sounds terrible!" but we quickly ate our words, and ate every bit of the mac and cheese! The "cheese" was so rich and full of flavor, and the subtle hints of garlic really made it stand out. I would choose this over normal mac and cheese any day. After the mac and cheese, I had the Beet Falafel Burger. The burger was not like other veggie burgers I've had before. This crunchy burger was accompanied by arugula, apple slaw, a side of kale salad and a side of dairy-free tahini mayo. The tahini mayo was so good! It was sweet yet tart, and I loved the creamy texture. It complemented the burger and spiced it up a bit. This is one of the best veggie burgers I've ever had. For dessert we ordered the Ginger Tahini Cookie, the Cashew Cheesecake, and the Magic Bar. Despite what you might think, the Ginger Tahini Cookie did not taste like tahini. It had a warm, comforting feeling and a ginger-molasses taste. This was much better than I expected. The Cashew Cheesecake was super creamy, and it had a hint of sour key lime. Shockingly, it did not taste like dairy-free cashew cheesecake; it tasted like dairy-full, normal cheesecake. The Magic Bar was our final dessert. The bottom layer was a cookie crumb crust, the second layer was a creamy chocolate spread and the top layer was a chewy caramel delight. All the layers together tasted like a caramel s'more. The desserts were so much better than I expected (and I expect a lot)! I 100% recommend these. Fresh Thymes is definitely​ one of the best restaurants in Boulder. The modern interior, happy atmosphere and delicious foods at Fresh Thymes made for an amazing night. I really recommend trying this eatery. Christine telling us about her restaurant. Trying to wrangle the Rad Thai. First bit of the Ginger Tahini Cookies. Maryn and Colter happily finishing their food. This restaurant is definitely one of those rare restaurants where finding out-of-the-box food is not difficult. Fresh Thymes purposely does not have a kid's menu. Why? As Christine the owner says, "We want all of our dishes to be friendly to everyone". A good strategy for parents to get their kids to eat healthy food is to not tell them what is actually in it! I swear I could not tell the difference between their cashew cream sauce mac & cheese and a regular mac & cheese. It was that good! However, if you told the kids the contents of this food, they would run away, positive these dishes contained poison. How can cashew cream sauce be healthy for you and taste delicious? Surprise, surprise kids, it is both! For my beverage I had the house-made Ginger Limeade. This citrus beverage was very refreshing and was a great pallet cleanser. We decided to try all of the salads, so they prepared a special sample platter. This combination is not on the menu, but you can purchase them individually at the counter. First I sampled the beet salad. The beets had the classic, earthy undertone. Along with the cool temperature it was a very pleasant bite. I also enjoyed the Chickpea Flatbread. The bread had a nice, moist texture and a lovely rosemary oil on the side to dip in. The Brussels Sprout salad tasted just like a fresh garden, and I particularly enjoyed it's lovely dressing. I recommend the Chickpea Flatbread for kids. It's a very kid friendly option. Next up was the Rad Thai. This name is a play on words. On the plate was a pile of kelp noodles with peanut sauce, a nice slaw salad accompanied by a couple pieces of grilled chicken. The grilled chicken was expertly cooked and had a hint of a rustic charred flavor that was delicious. The kelp noodles looked a bit peculiar. I don't think any other restaurants in Boulder are serving kelp noodles because who would think of that? Anyway, I sampled the noodles and was surprised at the consistency. It was bit chewier than most noodles but oddly pleasing. The seasonings were more on the spicy end of the spectrum. I suggest this dish for the heartier pallets. Before I knew it, there was nothing left on the plate. Yum! A new hip trend for vegetarians is the veggie burger such as Fresh Thymes' Beet and Falafel Burger. The patty held together nicely and is one of my favorite veggie burgers in town! I liked the dairy free Tahini mayo on this burger as well. For my first dessert, I ordered the Cashew Cheesecake. This was a particularly risky option, but the end result turned out great! It was just as creamy as a normal cheesecake and the crust was crumbly in my mouth. Overall very enjoyable. Resembling a molasses cookie, this Ginger Tahini Cookie was a scrumptious delight. The chewy consistency was amazing and the extra-large portions were spot on. My final dessert was the Magic Bar. This was a salted caramel chocolate combination with dried coconut sprinkled on top. This bar held amazing qualities. The chewiness of the caramel really added to the rich saltiness of the salted chocolate. These components were great partners in crime. The coconut flakes on top were a nice addition. In conclusion, this restaurant looks scary for kids at first, but once you look deeper inside, Fresh Thymes has some great options for kids. It was a great dining experience!